I can assure you, the Scout car is in no way realistic; if Skoda produced a car that handles as badly as the Scout does, Skoda would be out of business pretty quickly. I have just one question: Why on Earth would you want to encourage what happens on the C-D Road somewhere else? If you find the C-D Road is getting boring for you, then I have a very simply solution; stop driving on it. There are plenty of areas throughout the map that are busy enough that you're never alone, but not so busy that it's like a game of Mad Max, such as Scandinavia and reworked sections of Germany. Having the C-D Road remain the busiest one in the game is great because it means all the madness and toxicity can stay there and not infect everywhere else. I honestly can't fathom WHY anyone playing ETS2MP wants to drive fast because there are so many games out there that support going stupidly fast much better than ETS2 does, such as Forza Motorsport/Horizon, Gran Turismo, GTA, Need For Speed, etc. What's the point in driving like a lunatic in a truck game and risk a costly collision and a potential ban, when you can get in a Ferrari in those games and do 200mph+.? My main issue with the reporting system is all the people who feel the need to announce their intention to report someone to the world. Nobody cares, stop doing it. If someone's caused you a reason to report them, just get on with it and keep quiet; the chat doesn't need to be flooded with "XXXX rec!". If I'm honest, I thought the Skoda Superb saloon/sedan was an odd choice for a pilot vehicle. Most pilot vehicles I've seen are estate/wagon types, especially BMW 3/5 Series ones. Estate versions allow the carrying of extra equipment that a saloon/sedan wouldn't be able to carry. I will not slow down for anyone overtaking me unless a collision is highly likely. As soon as someone makes an attempt to pass me, they're accepting all the responsibilities that come with doing so, including making sure they can do so quickly, and the road ahead is clear for them to do it. I won't speed up, but I won't slow down either. You lie in the bed the way you make it. 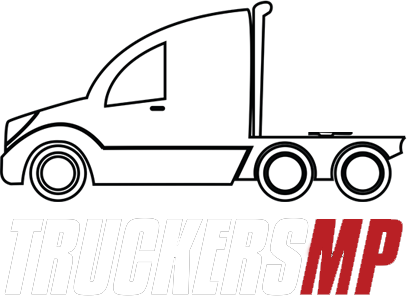 First truck game I played was actually an arcade game called 18 Wheeler: American Pro Trucker. With that out of the way, the first proper truck game I played was 18 Wheels of Steel: American Long Haul, and then years later, Euro Truck Simulator 2. My enjoyment of ETS2 primarily stems from my hobby of recreational driving in my car. I can do up to 150 miles in a night on a recreational drive in my car, which while enjoyable, it does come with a cost implication. As a result, ETS2MP is my go-to game when I can't take my real car out for a spin, which is also the reason I spend 95% of my time on ETS2MP in the Scout car. This is a ridiculous argument. People may not have 5 hours of free time per day, which then begs the question as to why they're playing a game based on using some of the slowest vehicles on the roads in the world to make long distance deliveries. People should be allowed to play it, but using lack of free time is a poor excuse for why speed limits shouldn't be imposed. Then what DO you think should be the speed limit? 90 km/h an hour in a vehicle that weighs 25+ tons is more than enough, and if people feel they need to go faster, then may I suggest a game designed for that, like Forza Horizon 4? OR, perhaps the version of #EU2 suggested by FernandoCR? I think at this point I'd be happy with EU1 simply allowing cars just so I can migrate away from the people on EU2 who struggle to comprehend the idea of driving normally. Please, please make this a reality; I'll even appeal to the Gods of Rome, Egypt and even the Norse Gods at this point. My real car (and it is my car in the photo) is a 2005 Saab 9-3SS with 220HP and 360Nm torque; 0-60mph in roughly 6.5 seconds. 130 km/h translates to 80 mph, and is the maximum speed limit for the vast majority of motorways in Europe, with the exception of certain parts of Germany. While it's not a realistic top speed for 99% of production cars on the road today, it is a realistic top speed limit for probably 70% of Europe. And yes, while the idea of the car is to behave like a car, the reality is that the car in ETS2MP still doesn't actually behave like a real car would; for a start, its steering is far too unresponsive which presents serious problems at higher speeds. To be honest, the only two problems with the Scout car now are: 1. The poor steering response; it lacks the snappy, responsive steering cars normally have 2. The current issue with the suspension/physics, although I'm not sure if that's been fixed because the car has been edited recently, but I haven't tested that. I'd like to see a compromise whereby cars are allowed in EU1, but where they're not able to be like unguided missiles, and aren't used to rake in huge amounts of cash via the caravan deliveries. Maybe I'm just biased because I like abiding by the rules in the Scout...unlike real life where my actual car gets used a little more spirited (I didn't get it remapped to 220HP and 360Nm of torque to drive like an old fart). I tested the Scout for myself, with a 2.0L TDI (125kW - 168HP) engine, and it accelerated from 0-100 km/h in just over 11 seconds. For comparison, the Skoda Superb (for which the Scout is modeled on) has the same engine, but managed to accelerate from 0-100 km/h in 8.6 seconds. However, this poorer acceleration isn't outside the possibility of the real Skoda Superb, as its worst performing engine is the 1.6 TDI which accelerates from 0-100 km/h in 12.5 seconds. In terms of the gear ratios you've chosen, that would be a very quick way to wreck both the gearbox and engine. A standard low-performance executive car would not do well with those kind of speed ranges in each gears, only performance cars can. Furthermore, your speed ranges are completely wrong; why do you think the 2nd gear should increase speed by 25mph when the first gear does 35mph? And then you want to be able to do 100+ km/h (62+ mph) in just 3rd gear? Hope you've got good money for a replacement gearbox and engine. I honestly don't think the change is that bad, although it could be better, and I use the Scout most of the time. @FernandoCR [ESP] Would you consider, if it were possible for the team to implement, a slight increase on car speed limits for EU1; to a realistic degree of course? Talking about max speeds of 60mph (96kmh) or 70mph (112kmh) given that those are real speed limits in most of Europe, and the car is a bit more stable and more car-like than it used to be. I could see that as a good compromise, especially if you nerfed the rewards for caravan deliveries to a more sensible and realistic level (or removed them completely from EU1) as that would probably only really leave people like me who want to drive the car in a simulated way.